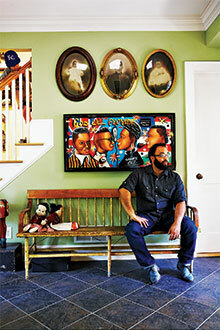 Emory University poet Kevin Young has won the 2015 Lenore Marshall Poetry Prize for "Book of Hours," his collection of poems about the loss of his father and the birth of his son. The Lenore Marshall Poetry Prize recognizes the most outstanding book of poetry published in the United States in the previous calendar year. Young is the Charles Howard Candler Professor of English and Creative Writing at Emory University, and curator of literary collections and of the Raymond Danowski Poetry Library at Emory's Stuart A. Rose Manuscript, Archives, and Rare Book Library (The Rose Library). "As if walking through a gallery of grief, reverie, and transcendence, Kevin Young's 'Book of Hours' exemplifies what poetry can do in the world when language works at its full power," said judge A. Van Jordan. "The poems in this collection hold emotion taut on each line while allowing for the nimbleness of language to drape over them, bringing tension between the heart and the mind, as Young consistently surprises us with profound elegance." Young is the author of eight other books of poetry, including "Ardency: A Chronicle of the Amistad Rebels," winner of a 2012 American Book Award; and "Jelly Roll: A Blues," a finalist for the National Book Award. He is also the editor of "The Hungry Ear: Poems of Food & Drink," and seven other collections. His book, "The Grey Album: On the Blackness of Blackness" won the Graywolf Press Nonfiction Prize, was a New York Times Notable Book and a finalist for the National Book Critics Circle Award for criticism, and won the PEN Open Book Award.